Cox’s Bazar – Thousands of Rohingya refugees who have settled in the villages of Shamlapur, Leda and Unchiprang in the southern part of Cox’s Bazar district are at risk of being left out of humanitarian aid programmes as international attention focuses on the humanitarian crisis in the main Kutupalong and Balukhali settlements. Since 25 August, an estimated 622,000 refugees have fled violence in Myanmar to seek refuge in Cox’s Bazar. This brings the total number of refugees in the district to an estimated 834,000. Although most are in the main settlements, over 74,000 Rohingya refugees are living in the smaller Shamlapur (22,067), Leda (22,130) and Unchiprang (29,915) sites. IOM emergency managers say that the three sites urgently need to be developed. This includes provision of vital infrastructure, including access roads, lighting and waste management. Unchiprang, which has seen a huge wave of spontaneous settlement in the past three months, is at greatest risk. As with the main settlements, people in the smaller settlements suffer from crowded living conditions, which inhibit the expansion of vital WASH services. “Most of the temporary pit latrines are full. With little to no land for desludging, they are becoming unusable and a danger to communities living nearby,” said IOM WASH specialist Stephen Waswa Otieno. He noted that in Leda there is only one latrine per 47 people – well below the humanitarian “Sphere” standard of one per 20 people. In Shamlapur there is one per 16 people, but most are full or dangerous and in need of decommissioning. In Shamplapur, where there is also only one well per 57 people. Many are contaminated with e.coli or are too shallow to provide enough clean water for the population through the dry season, he adds. IOM is also providing WASH services to local communities living around the sites, where stretched public services in underdeveloped villages are taking their toll on people who already had very little and are now hosting Rohingya refugees on their land. IOM’s doctors working in the three areas also report that patient numbers are now outstripping capacity. They have conducted 42,320 consultations with Rohingya refugees and villagers from the host community since 25 August. 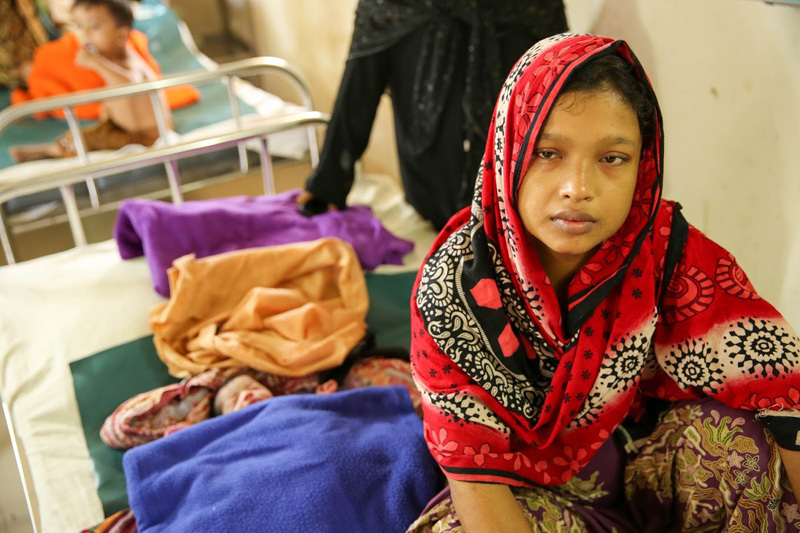 Aisha, a recently arrived 20-year-old Rohingya refugee, gave birth to her first child in the IOM Health Clinic in Leda last Tuesday (14/11). The yet-to-be-named baby girl lay sleeping as her mother told their story. Aisha was six months pregnant when her village was attacked and she and her family were forced to flee. They ran to the river and crossed it to eventually reach Bangladesh. “I only had the clothes I was wearing,” said Aisha. She remembers the pain of escaping when heavily pregnant and the need for frequent rest stops. Her husband, who was with her when they arrived in Bangladesh, has yet to see their baby daughter. He is currently receiving treatment at a Cox’s Bazar hospital supported by IOM, for gunshot wounds he sustained fleeing Myanmar.